Hey there fabs! Today I'm taking a walk on the wild side. Well, not literally but you get my point. Ha! 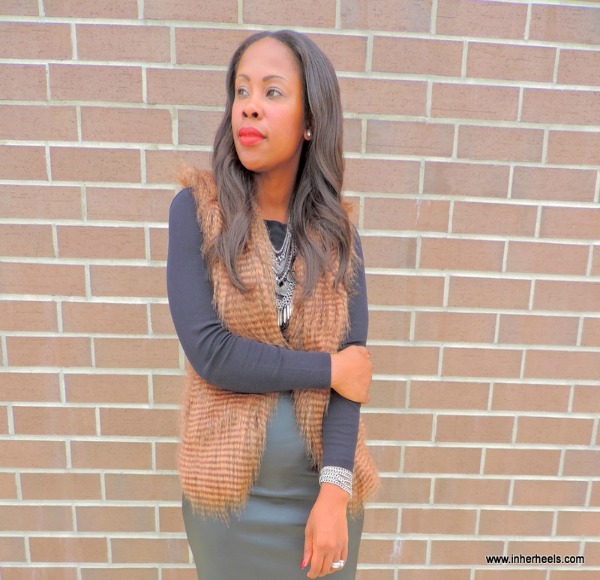 Faux leather, faux fur you name it because it's in and it's chic! When I first laid eyes on this piece in the display window at Forever 21 I had to have it. There are so many ways that a piece as chic as this one can be worn. An all black turtle neck with black leggings and wedge boots is one super chic look for sure! I have two looks here on the blog but I can think of a few more. One thing for sure the faux fur vest is for the bold and fashionable fashionista who isn't afraid of her own personal style! Do you follow me? I will definitely be rocking this piece when I return to New York during the Christmas holiday.